We have knowledgeable technicians who provide furnace installation and other maintenance services to commercial customers in Barrie. A commercial furnace is typically much larger than a furnace found in a residential property. If something isn’t working properly within your furnace, it’s best to bring in a skilled professional who can handle the task with ease. 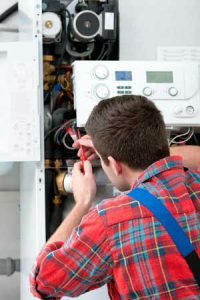 At L&B Mechanical, we have knowledgeable technicians who provide furnace installation and other maintenance services to commercial customers in Barrie, Ontario. Whether you’re building a new office space and need someone to perform furnace installation or you have an old unit that needs replacement, we can tackle the job and keep your building warm and toasty. When you choose L&B Mechanical, you can feel confident that our team members will take good care of your HVAC system during the task. We will make sure to choose a unit that fits in the available space and is able to keep up with the needs of your building and those who work in it. Many people who attempt DIY furnace installation find that they’ve purchased a unit that is the wrong size or has to run constantly to keep the temperature up. It might seem cheaper to try to install a furnace yourself, but it’s always better to enlist a professional. We’ll make sure to get the job done correctly on the first try, and we’ll always seal the ducts after the furnace installation is complete, lessening the risk of poor air circulation and inefficiency. Give us a call today when you’re looking for furnace installation services for your commercial business in Barrie.